The kneecap is contained within the quadriceps tendon, the tough sinew that links the thigh muscle to the shin bone. Its main function is to improve the efficiency with which the quads straightens the knee and to stop the knee bending when weight in taken on the foot. Kneecap stability is very dependant on its shape matching the shape of the groove on the thighbone (trochlea) within which it runs. If either the kneecap or the groove is too flat, or if the muscle pull on the kneecap is in the wrong direction, then it is liable to dislocate. When this happens it damages the ligaments on the inside of the knee that usually help to keep it in position and this may lead to recurrent instability. 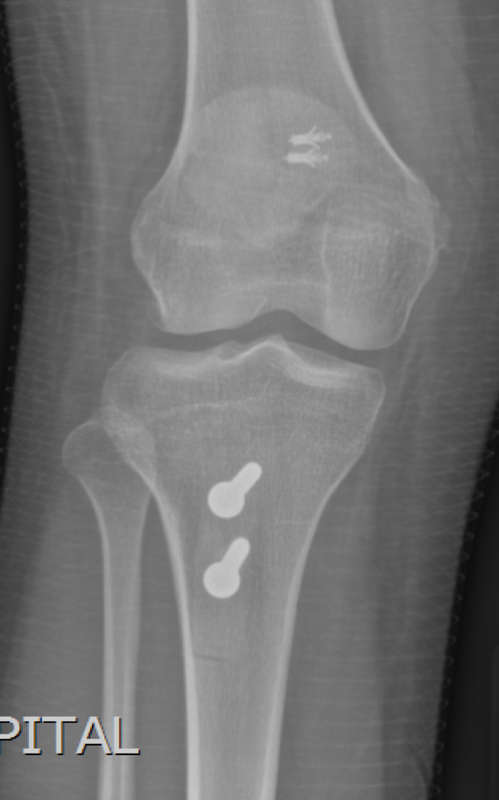 An x-ray of a kneecap dislocation showing the patella a long way from home! Physiotherapy is usually the first line of treatment for a single episode of instability. This focuses on reducing the inflammation and swelling caused by the traumatic episode and regaining movement and muscle control. Once the initial phase of therapy has been successfully treated, your therapist will attempt to retrain the muscles in your whole leg and core areas to avoid similar episodes recurring. Surgery is usually reserved for recurring dislocation. An MRI scan of the knee will help to diagnose the exact underlying problem that has led to instability. This can then be addressed by surgery tailored to your diagnosis. Three main types of surgery exist. The first and most commonly employed consists of reconstructing the Medial Patellofemoral Ligament (MPFL). This connects the kneecap to the inner part of the thigh bone and acts like a car seatbelt, only stopping the kneecap if it is about to dislocate. The second type of surgery shifts the attachment of the kneecap tendon on the shin-bone to better align it with the groove on the thigh bone. The third type deepens the groove on the thigh bone, capturing the kneecap more securely.